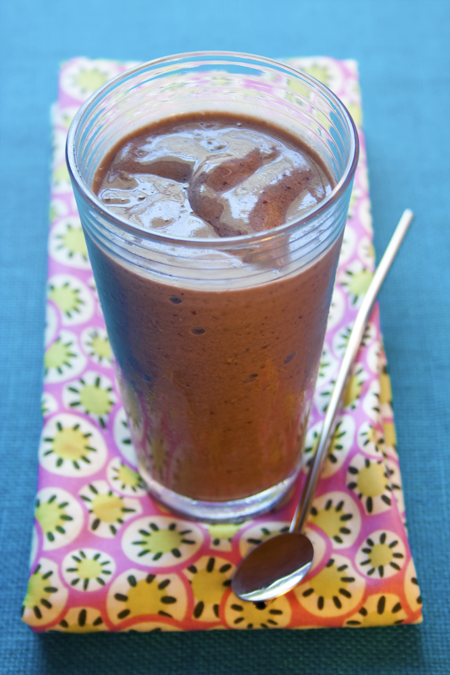 A delicious and nutritious smoothie that taste just like a banana split. No added sugars. A cool summer treat with a whopping 10 grams of fiber. Want to know what others thought about this recipe? Would you like to comment on this recipe? Go to the Banana Split Smoothie blog entry. In a coffee cup mix together cocoa powder, sweetener packets, salt, vanilla and water. Place in microwave for 34 seconds. Stir the mixture again until lumps are gone. 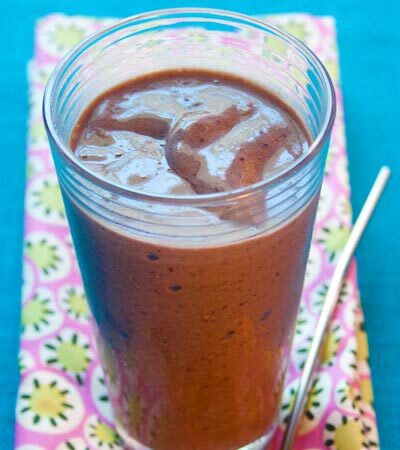 In a blender add, banana, cherries, ice cubes, soy milk and then chocolate mixture. Blend on medium speed until creamy smooth. You may need to add a tad more soy milk. Add slowly by the tablespoon. You can quickly add too much soy milk and get it too watery. I don't recommend using rice milk. Rice milk doesn't have the creaminess of soy milk and will make your smoothie taste watery. Original Food Photography & Original Recipe Text Copyright 2007-2014 Josh Latham. All Rights Reserved. Permission granted to reproduce for personal and educational use only. Commercial copying, hiring, lending is prohibited.